Polling for the Assembly elections to Andhra Pradesh, Odisha, Sikkim and Arunachal Pradesh took place on Thursday. New Delhi: Polling for the Assembly elections to four states — Andhra Pradesh, Odisha, Sikkim and Arunachal Pradesh, that begun at 7 am on Thursday, came to an end at 6 pm. The voting for all the 175 Assembly seats in Andhra will concluded at 6 pm. A total of 2,118 contestants are in the fray. 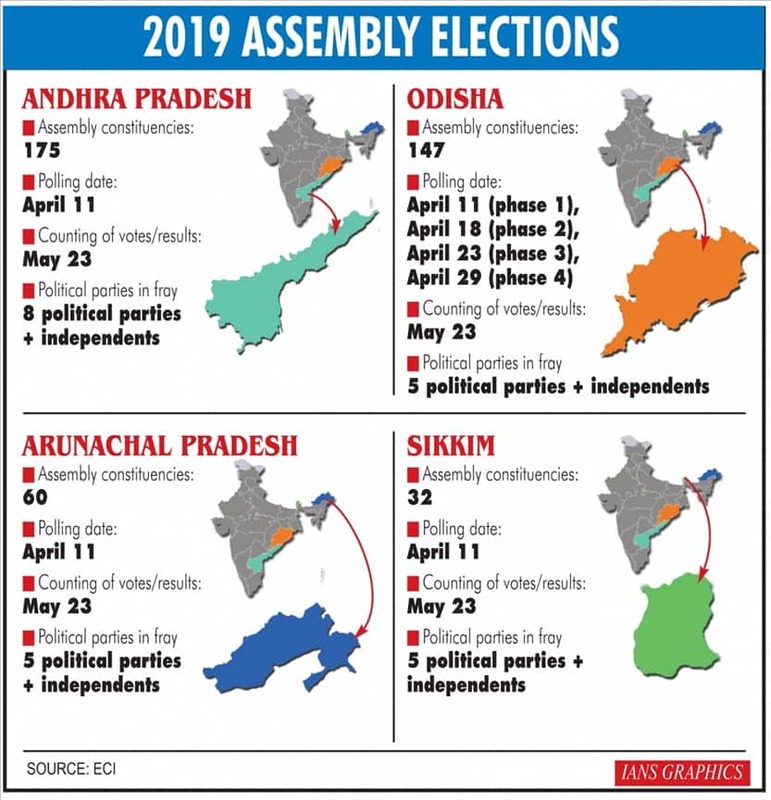 Notable, this is going to be the first assembly election for Andhra Pradesh following the bifurcation of Andhra and formation of Telangana in June 2014. The first phase of polling for 28 assembly seats in Odisha will decide the fate of 191 candidates, including 16 women. There are 21 Lok Sabha and 147 assembly seats in the state. In Arunachal Pradesh, a total of more than 7 lakh voters will exercise their franchise for the Assembly polls today. As many as 181 candidates including 11 women are in the fray for 57 assembly constituencies out of total 60 seats in the state. Lok Sabha and assembly elections are held simultaneously in these four states. The counting of votes will be held on May 23. Andhra assembly election: Official sources said clashes between TDP and YSRC workers were reported in Guntur, Anantapuramu, West Godavari, Prakasam, Kurnool and Kadapa districts, but did not specify deaths. Andhra Pradesh CM Chandrababu Naidu claims at least 30 per cent of EVMs encountered problems across the state, a charge the Election Commission denied. Polling in Andhra Pradesh was held simultaneously for 175 Assembly seats featuring 2,118 candidates and 25 Lok Sabha seats having 319 contestants. An impressive turnout of over 73 per cent recorded in single phase assembly and Lok Sabha elections in Andhra Pradesh on Thursday. 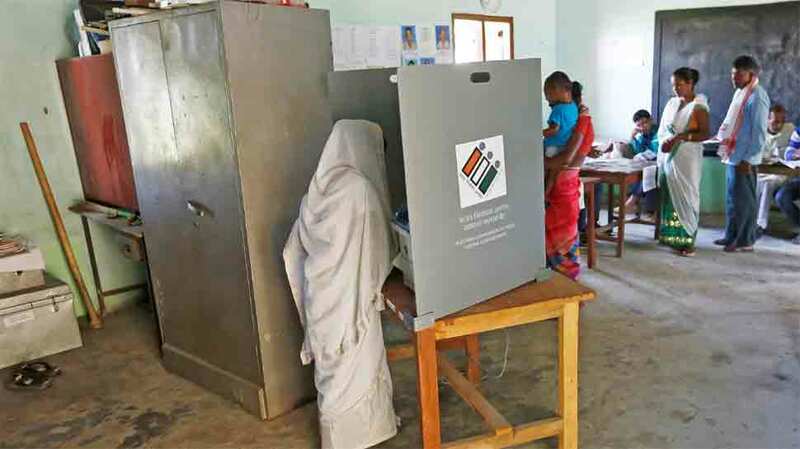 Odisha Chief Electoral Officer said that six booths of Chitrakonda in Malkangiri district saw no voting due to threat by naxals. Telugu Desam Party (TDP) accuses YSR Congress Party (YSRCP) leaders of indulging in violence and damaging electronic voting machines (EVMs). "There is a lot of violence in Kadapa, Anantapuram, and Kurnool and Nellore districts...In certain cases, they have even damaged the polling materials like EVMs and threatening polling personnel to allow them to rig votes," Andhra CM N Chandrababu Naidu writes to state DGP RP Thakur. Odisha: While polling will be held in eight assembly segments till 6 pm, voting will end at 4 pm in 20 Maoist-affected constituencies. Odisha Congress spokesperson Sonali Sahoo quits party, expressing displeasure over ticket allotment for assembly elections. Voter turnout in Arunachal Pradesh was 50.87 per cent till 3 pm. Three persons injured as supporters of two rival political parties clashed in Tali Assembly constituency of Arunachal Pradesh during polling. Andhra Pradesh: A YSRCP worker taken to a hospital after he was injured in a clash which broke out between YSRCP and TDP workers at a polling station in Jammalamadugu Mandal of Kadapa district today. Biju Janata Dal (BJD) writes to Chief Electoral Officer, Bhubaneswar, over violation of EC guidelines by BJP for holding press meet today and details of the same being provided on scrolling news on OTV. Good job, political stability and peaceful environment are on the wish list of many first time voters in Arunachal Pradesh, where simultaneous Lok Sabha and assemly polls are being held on Thursday. Andhra Pradesh: A clash broke out between workers of TDP and YSRCP at a polling station in Srinivasapuram Village of Gurajala assembly constituency in Guntur district. TDP leader S Bhaskar Reddy killed in clashes in Tadipatri town of Anantapur. TDP has alleged that YSRCP workers are behind the incident. Clash breaks out between YSRCP and TDP workers in Puthalapattu Constituency in Bandarlapalli, Andhra Pradesh. Police resorted to lathi-charge. Jana Sena chief Pawan Kalyan at the polling booth set up at Chaitanya School in Vijayawada. Malfunctioning of electronic voting machines (EVMs) disrupted the polling in Andhra Pradesh briefly in some constituencies. The polling at Kanchikacherla village of Krishna district had to be halted till the machines were rectified or replaced. An overall 7 per cent voter turnout was recorded till 9 am in Odisha. Lok Sabha seats - Koraput recorded 10 per cent and Berhampur recorded 11 per cent. Malkangiri, which is an assembly seat, recorded 4 per cent. Life in Kashmir was disrupted Thursday due to a strike called by separatists to protest against polling for first phase of Lok Sabha elections in the Valley and NIA action against Hurriyat Conference leaders and their kin, reported news agency PTI. Shops, business establishments and educational institutions remained closed due to the strike while attendance in government and private offices was thin, officials said. Jana Sena MLA candidate Madhusudhan Gupta smashes an Electronic Voting Machine (EVM) at a polling booth in Gooty, in Anantapur district. He has been arrested by police. Telangana Rashtra Samithi's K Kavitha casts her vote at a polling station in Pothangal, in Nizamabad parliamentary constituency. YSR Congress Party chief Jaganmohan Reddy after casting his votes in Kadapa: I'm very confident, people are looking for a change, vote without fear. Andhra Pradesh Chief Minister Chandrababu Naidu and his family after casting their vote for Lok Sabha election in Amravati. People queue up at a polling booth in Amaravati to cast their vote. Meanwhile, Prime Minister Narendra Modi tweets and says. #LokSabhaElections2019 commence today. I call upon all those whose constituencies are voting in the first phase today to turn out in record numbers and exercise their franchise. I specially urge young and first-time voters to vote in large numbers. Voters queue outside polling booth no 134 in Pulivendula, ahead of voting for the first phase Lok Sabha election. "Election day is when we must all take the lead and march to polling booths. At ZEE we pledge to encourage voter turnout by pausing our shows & content across our channels on election days from 8 AM-10 AM. Requesting every eligible Indian citizen to go out & vote. #GrownUpsGoVote," tweeted Punit Goenka, MD & CEO, Zee Entertainment Enterprises Ltd.
Google on Thursday marked the beginning of first phase of Lok Sabha poll in India with a doodle. The Google doodle shows an inked finger and when a user clicks on the inked finger then the user lands on a page that explains the voting procedure. The page contains several information which are very helpful for first-time voters.